News | Blog | Pygmy shrew under threat? Is the pygmy shrew under threat from the greater white-toothed shrew in Ireland? Until recently the pygmy shrew (Sorex minutus) was Ireland’s only shrew species, having most likely been introduced to Ireland from Britain several thousand years ago. A very common species in Ireland, it is one of the world’s smallest mammals, weighing a mere 3 to 6g as an adult. The species is characterised by its long, thin snout, relatively thick and hairy tail, and its distinctive red-tipped teeth. But change rather than constancy is the norm in natural systems. In this case, change arrived within the last decade in the form of the greater white-toothed shrew (Crocidura russula), now Ireland’s second shrew species and increasingly being viewed as an invasive species. This species is up to three times larger than the pygmy shrew, has prominent mouse-like ears, a relatively thin tail and as its common name suggests, white teeth. A collaborative study by researchers in University College Dublin, Queen’s University Belfast, University College Cork, Birdwatch Ireland and Cornell University, supported by the Vincent Wildlife Trust amongst others, is now starting to reveal the full consequences of this change for the pygmy shrew in Ireland. The biota of Ireland is no stranger to the threats posed by invasive species. The increased movement of peoples and goods has led to problems with invasive species globally, and Ireland is certainly no exception. Invasive species are introduced species that adversely affect the regions and habitats that they invade. This can take the form of negative economic, environmental or ecological impacts. 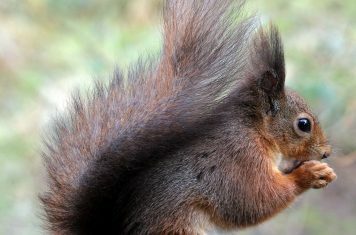 Nowadays, the general public in Ireland is familiar with some high profile cases of invasive species, such as the invasive North American grey squirrel (Sciurus carolinensis) causing the decline of the red squirrel (Sciurus vulgaris), or the arrival of the ecosystem engineer, the zebra mussel (Dreissena polymorpha), to Irish freshwaters in the 1990s. These are examples where the impact of an invasive species can be easily observed through declining abundance of an existing species or noticeable changes to the ecosystem at large. Not all cases are as high profile or as obvious. Away from prying eyes, the greater white-toothed shrew is already causing a disturbance in the undergrowth. The greater white-toothed shrew was discovered in Ireland from pellets of barn owls (Tyto alba) and kestrels (Falco tinnunculus) collected in 2007, with later confirmation by live-trapping in 2008. It was intially thought that the species was confined to Counties Tipperary and Limerick. The greater white-toothed shrew coexists with the other small mammals in continental Europe. At the time of its discovery it was reasonably assumed that the species could be a beneficial addition to the Irish fauna, and provide another food source for birds of prey and mammalian predators. However, in an early warning sign during the winter of 2010/2011, Ian Montgomery and colleagues at Queen’s University Belfast found that pygmy shrews were absent where the greater white-toothed shrew was established. As previously Ireland’s only shrew species and the island being one of the strongholds for the species in Europe, the potential disappearance of the pygmy shrew was seen as a worrying development. The absence of the pygmy shrew where the greater white-toothed shrew was present was unexpected because these two shrew species coexist over much of western Europe. Although the pygmy shrew tends to be rare on the continent there are exceptions, for example, on the French island of Belle Île where pygmy shrews are abundant and coexist with greater white-toothed shrews. This demonstrates that coexistence between the two shrew species is possible on an island with habitats similar to Ireland. By the end of 2011 it was clear that a more intensive survey was necessary during the summer (when both shrew species are most abundant) in order to establish the full extent of the problem. We started this work in 2012 with the aim of gaining an accurate assessment of the greater white-toothed shrew’s invasive range in Ireland, the rate at which it is expanding, and the effects that the species is having on the pygmy shrew across the entire range of the invasive shrew. Our first goal was to determine the distribution of the invasive shrew in Ireland. A previous estimates had put the size of the range at 2,300km2 in winter 2010/2011. We found that the size of the range was much larger and was over 7,600km2 as of November 2013, with the shrew’s main invasive range taking in the counties of Tipperary, Limerick, Cork, Waterford, Laois, Offaly and Kilkenny. This pointed to the species being present in Ireland prior to its discovery in 2007. Using data collected from a variety of sources (live-trapping, bird of prey diet and records from the National Biodiversity Data Centre) since 2007, we estimated that the species began to expand around 2004 and has been spreading at a relatively constant rate of around 5km per year. For a small mammal, this is a startling rate of spread so we tested this further by modelling the rate of expansion independently at four sites between 2012 and 2013. We found that the rate of expansion varied from no movement at all to 14km per year. In addition to spreading rapidly on its own four legs, the greater white-toothed shrew is now showing up in isolated pockets beyond its main invasive range. Isolated populations have been found in Cork city and outside Mullingar, Co. Westmeath. This suggests that the species is moving around with the help of humans within Ireland. The species can be abundant around houses and farms in Ireland so this anthropocentric behaviour may facilitate its spread through transport with livestock and horticultural produce. What implications does this rapid spread have for the pygmy shrew in Ireland? 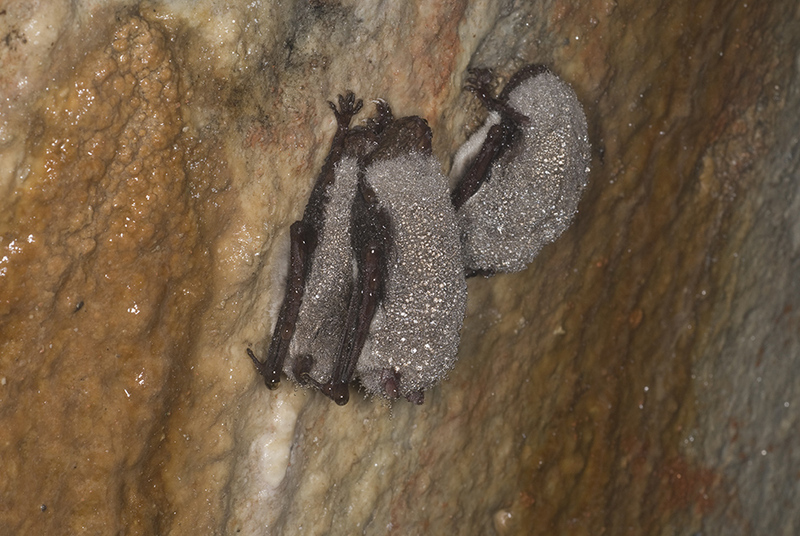 Unlike previous surveys, we found many sites where the greater white-toothed shrew and the pygmy shrew were found together. However, all these sites were on the very edge of the greater white-toothed shrew’s range, with the pygmy shrew being completely absent from sites where the greater white-toothed shrew has been established. Four sites from 2012 where the two shrews were present together were revisited in 2013, and the pygmy shrew had already disappeared from two of these sites. These results all suggest that the pygmy shrew is quickly disappearing when it comes into contact with the invading shrew. Why is the greater white-toothed shrew seemingly causing the local extinction of the pygmy shrew in Ireland? There are several hypotheses, but no clear answer as yet. Competition from overlap in their diet could be leading to the pygmy shrew’s local extinction. Both species are insectivores and in the presence of competing shrew species the pygmy shrew normally preys on smaller insects. However, the pygmy shrew has been Ireland’s sole shrew species for several thousand years at least, so it may have evolved a dependency on larger insect prey. With the arrival of the much larger greater white-toothed shrew may impact this available resource. The much higher densities of the greater white-toothed shrew compared to the pygmy shrew (despite the pygmy shrew being smaller, it has a home range much larger than the greater white-toothed shrew) could compound this competition between them. The sudden appearance of large numbers of the new shrew may lead to an increased number of predators and this could spell further trouble for the pygmy shrew as it is exposed to increased predation. It is also possible that the greater white-toothed shrew has brought in a new pathogen that is killing off the pygmy shrew. At this point it is clear that further work is now needed to identify the exact mechanism by which the pygmy shrew is being displaced. Unfortunately, the local extinction of the pygmy shrew may continue in Ireland as the greater white-toothed shrew carries on spreading rapidly. Increased habitat specialisation of the pygmy shrew as a response to the new invader may not be possible because of the relatively homogenous nature of the Irish landscape (being ~80% agricultural land). Habitat types such as peatland (where pygmy shrews are especially abundant) and forests are of a fragmentary nature in Ireland and may not support a long-term, viable Irish population. Given that eradication of the greater white-toothed shrew is unfeasible at this point because of the large area that it occupies, this may mean that Ireland’s small offshore islands (of which pygmy shrews inhabits many) will become an important long-term refuge. The invasion of the greater white-toothed shrew may have broader implications for the Irish ecosystem beyond the disappearance of the pygmy shrew. Research led by John Lusby of Birdwatch Ireland is finding that barn owl offspring survival is generally lower within the range of the invasive shrew, with higher mortality rates and chicks in poor health in certain sites. Ongoing research is now determining the impact of the greater white-toothed shrew on the overall breeding success in barn owls. At present, it is important to note that the greater white-toothed shrew is not considered as an established or potential threat by the authorities in the Republic of Ireland. Multiple studies have now confirmed that the pygmy shrew has disappeared within its established range and there are concerns about those species which predate on the invasive shrew. As a first step, it needs to be recognized as an invasive species with serious ecological impacts on Ireland’s fauna. McDevitt A.D., Vega R., Rambau R.V., Yannic G., Herman J.S., Hayden T.J., Searle J.B. (2011). Colonization of Ireland: revisiting ‘the pygmy shrew syndrome’ using mitochondrial, Y chromosomal and microsatellite markers. Heredity 107: 548-557. McDevitt A.D., Montgomery W.I., Tosh D.G., Lusby J., Reid N., White T.A., McDevitt C.D., O’Halloran J., Searle J.B., Yearsley J.M. (2014). Invading and expanding: range dynamics and ecological consequences of the greater white-toothed shrew (Crocidura russula) invasion in Ireland. PLOS ONE 9: e100403. Montgomery W.I., Lundy M.G., Reid N. (2012). ‘Invasional meltdown’: evidence for unexpected consequences and cumulative impacts of multispecies invasions. Biological Invasions 14: 1111-1125. Montgomery W.I., Montgomery S.S.J., Reid N. (2014). Invasive alien species disrupt spatial and temporal ecology and threaten extinction in an insular, small mammal community. Biological Invasions. doi: 10.1007/s10530-014-0717-y. O’Meara D.B., Sheehy E., Turner P.D., O’Mahoney D., Harrington A.P., Denman H., Lawton C., MacPherson J., O’Reilly C. (2014). Non-invasive multi-species monitoring: real-time PCR detection of small mammal and squirrel prey DNA in pine marten (Martes martes) scats. Acta Theriologica59: 111-117. Tosh D.G., Lusby J., Montgomery W.I., O’Halloran J. (2008). First record of greater white-toothed shrew in Ireland. Mammal Review 38: 321-326. Allan is a molecular ecologist who specialises in using genetics to inform conservation and to reconstruct the evolutionary history of mammalian species in Ireland, Europe and North America. Jon is a lecturer in ecological modelling at University College Dublin. His research focuses upon the ecology of invasions and dispersal.